Hello friends! I'm headed off to Vietnam/Thailand/Hong Kong/Seoul (24 hours) in about a day, and I thought I'd show my blog a bit of love before I take off. I've loved traveling since I was a kid, but with my love for traveling also comes a love for...packing. I'm weird, I know. My mom has let me pack my own bags since I was super young, which I've appreciated as a way for me to learn how to plan for trips. I remember the first time she let me do that, I forgot to pack any underwear and had to hunt for tiny children's underwear in Vancouver. I've come a lot further since then (hopefully). For the last few years, I've become pretty obsessed with the idea of traveling only with a backpack, and recently realized there was an entire online community dedicated to "one-bagging". For me, packing only a small backpack forces me to think critically about every object that I bring, and also forces me to do research about the places I'm going and to think about potential situations I will have to deal with. I have really sensitive shoulders, so it also greatly reduces the weight I have to carry, and therefore makes traveling significantly more enjoyable. It's definitely a mindfulness exercise, and the overall process of choosing exactly what to bring is incredibly enjoyable to me. Below is (mostly) what I'm bringing on my 4 week trip, all packed in a 19 liter backpack (for size comparison, the standard Jansport backpack is 25 liters...this bag barely fits a 13 inch laptop!). The packing cube contains all of my clothes, and I didn't include my toiletries in this picture. Hopefully this is all enough to keep me healthily thriving for about four weeks. It might not seem like a lot, but I actually couldn't think of anything else that I would want to bring - in other words, doing this isn't a sacrifice to me at all. 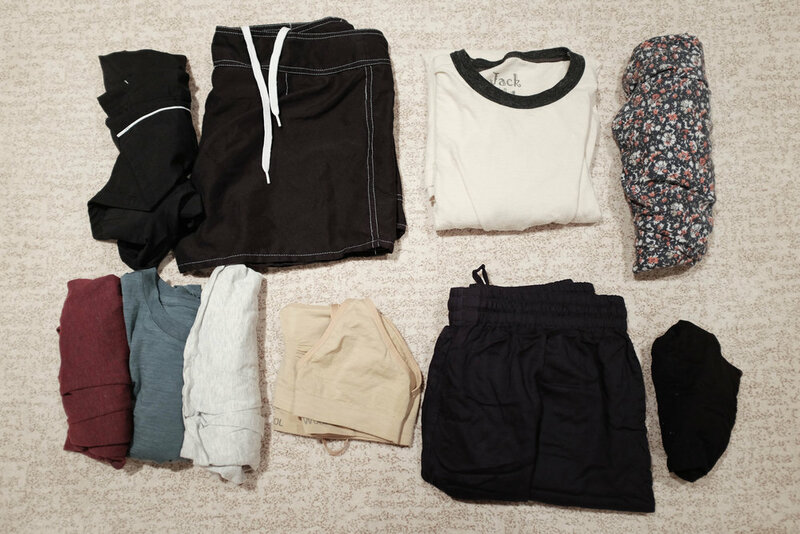 I'll probably have to do laundry a bit more than a normal traveler, but it shouldn't be too much of a hassle. I opted for phone/keyboard instead of laptop for this trip - photo editing will be done on Snapseed and keyboard will help for writing journal entries or any extensive editing. The Kindle and the 30+ books I want to read should keep me completely occupied on any long flights. Snap from a short hike to Red Rock Canyon in Lake Forest, CA this week.